I know there are quite a few of you out there, so I thought I'd let you know that the NBS mobile app is now available worldwide. Easy to download and it's very simple to use. Very useful for checking those pension payments and setting up TransferWise payments without having to dig out the card reader. I was quite pleased when I read this. However, "This app is incompatible with all of your devices." My devices are an Android 'phone and Android tablet. I still get the same message. Can you give a bit more detail of how you installed it please? I just wish that I could have ฿10 for everybody I've met with this problem who thinks that it is insurmountable. I first encountered it with the UK National Lottery app followed by an argument with the TV man who came to set up the Smart TV. Very simply, the problem is to do with the phone that you are using and its associated Google account. You set up the Google account on the phone for the Google Play Store as a Thai account and so apps from England are unavailable to you. It may be using English, but it's associated with Thailand. Now, all you need to do is to associate it with England as well and your N/Wide app will be avaiable for installation. Do NOT set up a new Google account to use on the phone under any circumstances, or you'll be in a world of pain. How do you enable access to the UK Play Store on your phone? Simple, add an address in England to the Thai Google Account. Log in at accounts.google.com not forgetting to set English in the drop down box at the bottom of the page if you are doing that in Thailand. Better still, add two payment methods to the Google account, say one from Kasikorn and one from the UK. Then your Google account will definitely be associated with both countries. I have four countries associated with mine. The same situation applies to eBay and other sites. No, you don't have to have two or more accounts. All you need is at least two addresses and two payment methods associated with the Google account to be able to access the Play Store of the countries concerned. Simples! Very interesting. My phone is new, only about 4 or 5 months old, but my google account goes way back and was set up whilst still the UK. I'm often a puzzled as to why I why get UK based adverts on my phone, despite being in Thailand and not using a VPN. I guess your Google account theory would explain it. But I have been periodically trying to download this App since I've had the phone without success until just a few days ago. Something else has changed and I have no explanation for that. One more point occurs to me. I did not download the app by going to Google Playstore. I was going to log on to my online account via the phone and was invited to 'continue to the app' from there. It might make a difference. Just another way for Nationwide to be able to track you. Claim to have a UK address? So why do you continue to log on to the app from Thailand? Do NOT set up a new Google account to use on the phone under any circumstances, or you'll be in a world of pain. 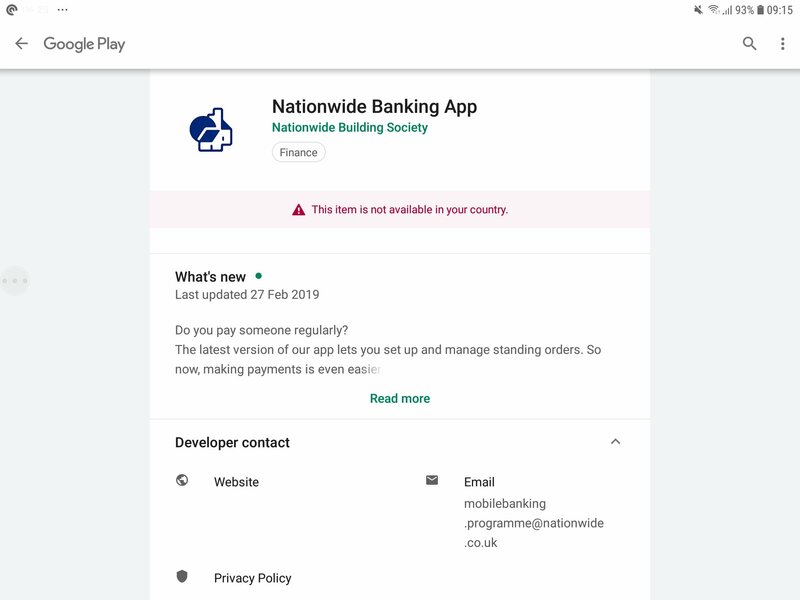 Great post...didn't know you could make one account multicountry for Google Pay purposes using the method you described. I do have one question and that relates to your comment above. Why would a person be in a world of pain? I have 3 US registered Google accounts and 1 Thai registered Google account. I created the Thai registered account so I could get Thai apps along with US apps....works fine...no problems. In answer to your query about 'pain', all the software being discussed is based around there being one Google account for that device. Using other accounts consecutively will result in problems updating software from the Play Stores and will affect the functionality of many other Google features. I've helped too many of those who simply think that 'It will be all right' until things start going wrong and the device has to be wiped and everything set up again from scratch properly. Their backups usually don't help them much as they had stopped working properly ages ago when the multiple accounts were first introduced. Just because a device with multiple Google accounts does everything you want at present, that does not mean it is advisable for the unwary to do so. In my opinion, I am merely giving a 'Here be dragons' warning that you may take or leave as you wish. I've had nothing but issues with Nationwide as they wont send me cards or a card reader here. Still Nat West just as bad. I have been living here for over 10 years as a Nationwide customer and recently received a new card reader only last month direct from them. You can always ask someone in the UK to go into a branch and pick one up and post it to you. They are freely available from any bank. Regarding cards such as Visa debit, they have always renewed them and have arrived at my Thai address without any problems so far. Wow lucky... I'll have to go back to UK to my branch to close it down. My cards and card reader are long out of date. I wonder why you have been able to do that? I must say Nat West are even worse and absolute and categorical NO to cards and reader (security risk blah blah). Maybe you have an UK address? I don't. Another nonsense theory. Nationwide are well aware of my location. I've lived in 3 different foreign countries over the last 30 years. They have always known my address in those countries and I've never had any problems receiving new debit or credit cards. I never understand why some people feel that it is necessary to hide their location from their bank. Banks are well aware of the mobility of many of their customers and are quite used to it.